The Dark Star storyline concludes and as it does we fall in love with Faith all over again. Introspective, kind, empathetic, and brave, Faith embodies the best that comic book heroes have to offer. Those virtues help define her and never better than in this issue where Faith must track down a dangerous psiot. The psiot in question is pop star Zoe who is emotionally scarred from a public scandal and through a seemingly magical talking cat has been empowered to wreak havoc by absorbing the energy of anyone she encounters. Soon, Faith is on her trail but finds out she's not alone. Project Rising Spirt intervenes to Faith's chagrin and the chase is on. What ensues is exciting and dramatic and as always Marguerite Sauvage's flashbacks are lovely and dreamy and worthy of a story all to itself, but it's the heart in Jody Houser's script and new artist Meghan Hetrick's illustrations that makes this issue soar. What happens when you strip a superhero of his or her power? What are you left with? Does the power make the hero or does the person make the hero? It's been clear from the beginning that Faith is not defined by her powers but instead by her character, integrity, and selflessness. All the things you'd want in a superhero, a role model, and Faith embodies them all. So it's not surprising that without her powers she uses her compassion to save the day. She quells the chaos with reason and empathy. Things we could use more of in the real world. 'Faith' doesn't need bombastic cliffhangers to be compelling. In fact, the sweet satisfying ending is poignant and subdued. It's more reflective and thought-provoking than you're used to and that's a good thing. 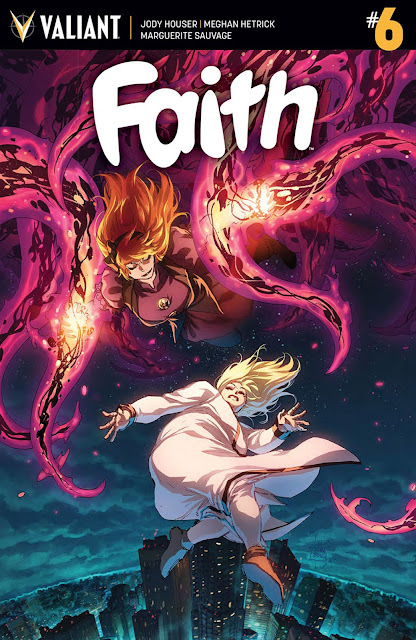 Faith aspires to be more than just another superhero comic and does it effortlessly with brains and heart.